"We’ve done just about everything we can to make sure we’re successful." When its Curiosity rover landed on Mars in 2012, NASA called the last, most perilous phase of the rover's descent "seven minutes of terror." Now the space agency's Mars InSight lander is a day away from its own slightly more compressed touchdown on the red planet. This time, NASA says the final phase of the spacecraft's landing will last about six and a half minutes — and members of the InSight team are trying to contain their rising anxiety. "It’s a little less terror," jokes Rob Grover, who leads the team in charge of InSight's landing at NASA's Jet Propulsion Laboratory in Pasadena, California. 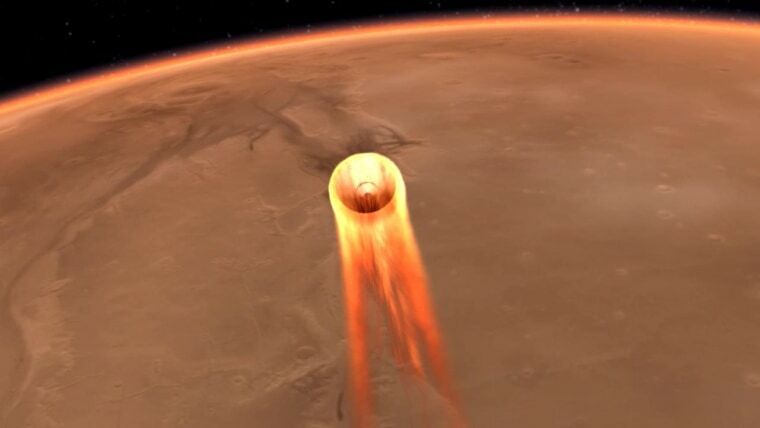 InSight, which is designed to study the red planet's deep interior, is scheduled to plunk down on the Martian surface on Monday at around 3 p.m. EST, after traveling more than 300 million miles since its launch in May from Vandenberg Air Force Base in California. Grover is a veteran of three other Mars landings; he was part of the teams that set the twin Spirit and Opportunity rovers down on the Martian surface three weeks apart in January 2004, and again when the Phoenix Mars Lander touched down in 2008. Recently, NBC News MACH spoke with Grover about what worries him most about the landing, how the InSight mission compares to previous excursions on Mars and how he and his colleagues keep their cool in Mission Control. MACH: How are you feeling now that landing day is right around the corner? Grover: The team is feeling pretty good. We’ve done just about everything we can to make sure we’re successful. There’s nerves and excitement, of course, and as we get closer that starts to amplify. But we’re feeling good about it. What’s involved with the landing process? All of our landers on Mars to date have used a similar landing architecture that goes back to the Viking missions that landed in the 1970s. There are some differences in the design of the lander itself, but all of them enter the atmosphere of Mars with an aeroshell. And the aeroshells that we’ve used are very similar in design — they’re just larger or smaller. The InSight aeroshell is identical to the Phoenix aeroshell, except it has a little bit of a thicker heat shield on it. It’s the same size and very similar to the Spirit and Opportunity aeroshells and even Pathfinder, so we know very well how these capsules fly through the atmosphere of Mars. So we enter the atmosphere of Mars, and about 99 percent of our speed is burned off or reduced while we’re flying through the atmosphere in the aeroshell. All of our missions then transition to a parachute, typically about 7 or 8 miles above the surface. And we use the parachute to do much of the rest of the slowing down of the vehicle. For InSight, we go from 12,300 miles an hour at the top of the atmosphere to 5 miles an hour at touchdown, so the system is designed to take all that speed out of the system. The landers that use rocket power for the rest of the descent typically separate from the parachute at nearly a mile, or a little bit less, and then do the rest of the landing under rocket power. InSight has three landing legs, so then we touch down as a traditional lander with landing legs. How do you make sure InSight lands upright? As it’s descending under rocket power, there are 12 engines that are clustered in groups of four around the bottom of the lander. Those rocket engines are carefully keeping the lander balanced as it’s descending, so they’re throttling up and throttling down a little bit to make sure the lander is horizontal and balanced. And then when we touch down, the lander legs have a switch at the top, and when the leg touches the surface, it triggers that switch and that automatically shuts the engines off immediately. It only takes one leg touching the surface to shut off the engines. And we do that so that the engines don’t continue to fire after we touch down, because that might cause some problems and could cause the lander to flip over, which would be bad. How soon will you know if InSight landed successfully? Because Mars is so far away at the time of landing, it’s going to take just over 8 minutes for the data and the signals that the lander is sending back to Earth to arrive at Earth. The whole landing, from the top of the atmosphere to touchdown, takes about six and a half minutes, so by the time we get signals, the lander will be on the surface already. But we’ll be watching as that data comes in as if it’s happening right then and there. How do you and your colleagues keep yourselves calm in Mission Control? We have a tradition at JPL of passing around a jar of lucky peanuts, which dates back to the 1960s. That’s one of our traditions, and it keeps things light. Certainly hearts will be pounding as we get to the top of the atmosphere and the landing starts, but it’s just part of the job. What will your schedule be like in the lead-up to landing? Our day-to-day operations are very similar right up until the night before. Our main task right now is to take the latest weather predictions for landing — we have a team of atmospheric scientists using the [Mars Reconnaissance Orbiter] spacecraft to observe the atmosphere and provide predictions for what the atmosphere will be like on Monday when we land. We take that information, along with the latest information from our navigators on what they think the trajectory looks like for the arrival at Mars, and we assess and make some small adjustments to the software parameters that are aboard the spacecraft that are going to be controlling the lander during the landing. We’re doing that every day in a repeated cycle as we get an atmosphere update and a trajectory update. We have the ability to modify the software parameters onboard the spacecraft all the way up until an hour and a half before landing, so we’ll be looking at that and deciding whether we want to make any final adjustment to how the landing will unfold. This weekend we’ll be doing that around the clock, so we’ll be on 24-hour operations starting Saturday morning through landing. Once the landing sequence starts, is it pretty much just a matter of hoping for the best? That’s exactly right. Because of the 8 minutes of travel time for the signal out to Mars and then back again — so it would be 16 minutes total round trip — there’s no way to joystick the spacecraft and fly it remotely from Earth. The entire landing has to be automated and controlled by the computer onboard the lander, so that’s one of the challenges. Once we’ve set up those last parameters and the sequence is running, we are in some ways watching just like everybody else, because there’s nothing we can do once the landing starts. What worries you most about the InSight landing? I think making sure that everything is going smoothly with the operations plan and that we are executing everything we need to and are going to have everything done in time for that last parameter update. We’ve rehearsed this three times over the last nine months, and we’ve rehearsed hour by hour for the last five days before landing, so we’ve really done this week three times before. We’re in good shape, and the team is well rehearsed and is executing really well. It’s challenging to land on Mars. There’s always the chance that we might have a bad day or the environment of Mars might be a little bit different from what we have been planning and designing for years now. It’s both nerve-racking and exciting mixed together. What’s the riskiest part of the landing? There’s a couple of times in the control room where we’ll be particularly happy as the landing is unfolding. One of them is parachute deployment. The parachute is not inherently extra-risky. But rather than being a rigid design like the metal lander, which is very predictable, it’s made of nylon. It’s what we call a soft good. And when we deploy that, it’s a little less predictable. While we’ve had great success deploying parachutes on Mars, and we expect to again, it’s one of those moments when we’ll be happy when it’s out and we know we’re descending under the parachute. Were there valuable lessons learned from pervious Mars missions? After each one of our missions that we send to Mars, we always do what we call EDL reconstruction, where we take all the landing data and basically put together the precise trajectory of the landing, how it behaved and how the flight software performed. We feed that to the next missions, so we accumulate better and better information of how to be successful on Mars. This particular lander is almost a carbon copy of the Phoenix landing system. The design is related to the Mars Polar Lander, which if you know your Mars landing history, wasn’t successful in the late ‘90s. We didn’t have real-time communication during that landing, so we don’t know exactly what happened to the Mars Polar Lander, but it did trigger a very detailed review of the design, and there were some potential failure mechanisms that were discovered. That really helped in designing the Phoenix lander, which really fed into our lander as well. That’s an example about how we used information gleaned from the previous mission to make the next mission more robust. Does InSight's landing site pose any specific challenges? The landing site may be one of the safest on Mars. It is one of the flattest places on Mars and has very low rock level. Those are two things, from a landing safety standpoint, that we look for. On both of those counts, this is a very safe place. Our project manager likes to say we’re landing on the Kansas of Mars. Once InSight is on the surface and you’ve had a chance to take a breath, what are you most looking forward to with this mission? Doing a Mars mission is just kind of magical. Once we have the science instruments out and start understanding more about Mars, that’ll be really cool, finding things out about the unknown. That’s a big part of contributing to a mission like this. The landing team, believe it or not, is mostly done about a week after landing. We won’t go on to any of the surface operations. Will you be involved with NASA’s 2020 Mars rover? I’m not yet sure where I’m going to transition to after InSight is finished, so we’ll see what the future holds.